Gracious Hospitality is having a Tea themed Blog-a-Thon! Share tea from the perspective of literature. Post a tea quote, a verse or poem, or story. Tell about a favorite tea book. This would be a good time to share how you use tea to encourage others. Do you minister to others by sending them tea themed cards to friends and shut-ins? Or another way you use 'tea' to share joy with others? I know some of you do --- so tell your story! My favorite tea related reading and recipes books. . .
Special Teas by M. Dalton King is indispensable if you plan to have a simple or ambitious tea themed get together. Filled with sumptuous recipes and gorgeous photographs, this book has menus and party suggestions challenging enough for the most experienced hostess but plenty for the beginner as well. Special Teas is on my list of top 10 cookbooks to own. Eating Royally : Recipes And Remembrances From A Palace Kitchen was a Christmas gift from my husband. He ran across the book in the library one day and being well acquainted with my fascination with the royal family, he checked it out and brought it home. I wasn't one chapter into the book when I was putting it on my Amazon wish list. Chef Darren Mc Grady's account of his years in service to the royal family is heart warming and insightful without being gossipy. The focus of the book is on the time the author spent as Princess Diana's personal chef, but the book contains traditional British recipes along with favorites of the royals. One of the surprising things I learned from this book is the relationship between the royal family and the food they eat. All menus and food are prepared according to what is in season and grown locally. There is as little waste as possible. The majority of the fresh items are grown at the estates and game and fish are obtained on Her Majesty's land as well. The strawberries grown at Balmoral are made into enough jam to last the family an entire year (the recipe is included). You'll come away with an enlightened view of the British monarch and her family. Chef McGrath's antecdote about the Queen and her scones is worth the price of the book. Park Avenue Potluck : Recipes From New York's Savviest Hostesses was a birthday gift from my husband. Proceeds from this book are donated to charity. Although the title sounds intimidating, the recipes are actually quite simple and yet delicious. While this should not be considered a book about tea parties, many of the desserts would be perfect for afternoon tea nibbles. Even the Creamed Artichoke-Spinach Casserole is wonderful the next day, chilled and served on crackers or sourdough. Anne Grauso's recipe for Paris Iced Tea is a sweet, fruity beverage that is just perfect for hot Arizona summers. Tea and Sympathy : The Life Of An English Teashop In New York is simply hilarious reading for any anglophile. The book consists of wickedly funny tales of this New York teashop, but chock full of traditional British recipes too. Forget the hat and white gloves, this ain't your Grandma's afternoon tea party. If you've ever watched "Friends" and wondered what went on in the back room at Central Perk, this is the book for you! 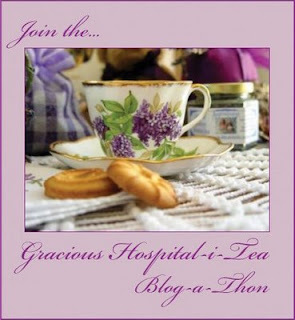 Click here for more Teacup Stories at Gracious Hospital-I-tie's Blog-a-Thon! Leanna, you have some excellent book titles here! Most of them are new to me and I look forward to finding the books and enjoying a good time reading! Thanks for sharing and for your participation in the Gracious Hospital-i-Tea blog-a-thon! Super reviews! Makes me want to read each and every one of the books on your list! Writing down book titles as fast as I can going to all these blogs with such great tea books that I had no idea were out there! Your post makes me want to read Eating Royally as I have never read it. Thanks for some great book reviews! Didn't know about Eating Royally. Have added it to my latest Amazon cart. Thanks. I can merely echo everyone else... Great reviews, and I shall be adding to my Amazon Wishlist! Tea and Sympathy sounds great. Thanks for sharing. I'm impressed with the royal family's seasonal eating. And strawberry jam and scones sound delicious with tea.